Charleston is a true gem of South Carolina. And if you haven’t seen it yet, add it to your travel bucket list right away. This is one of the most iconic cities in the Southeast, offering a heaping helping of history and southern hospitality everywhere you turn. It’s no problem finding things to do—it’s having enough time to do all things you want. Start with these 10 best activities in Charleston and let the exploring begin. You’ll notice the famous pineapple fountain straight away, but there’s plenty more scenery to explore and enjoy. There’s a huge green space for playing and picnics, as well as walkways along the waterfront that deliver breathtaking views of the area. There’s also free Wi-Fi in case you need to squeeze in a little work, and truly there’s no better place to set up a mobile office. This old open-air market has been a part of the city’s economy for well over 200 years and counting. Vendors are selling everything from handmade baskets to art to food to soaps and lotions. Located just a stone’s throw from the Waterfront Park, the market is proud to offer all locally made items, so you can take home a piece of the city no matter what you purchase. 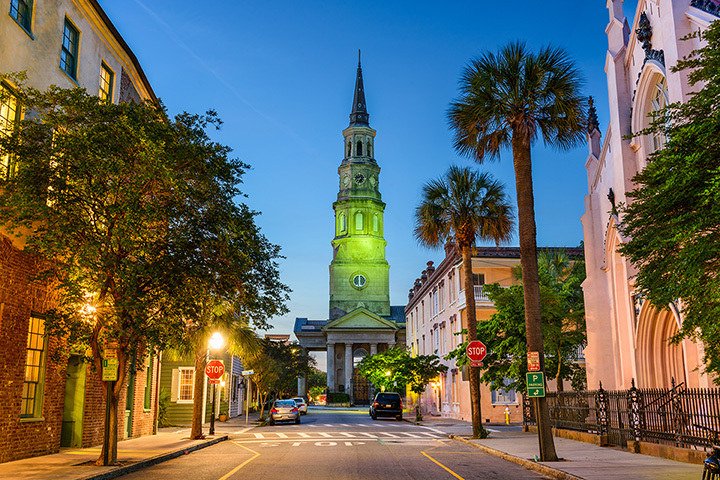 The Old City Jail is believed to be Charleston’s most haunted building, and you can take a guided tour through the property to find out for yourself. The jail was once home to some of the country’s most dangerous criminals at the time, including pirates and Civil War prisoners. The tour takes you through real jail cells and the warden’s quarters, and visitors have claimed to have heard ghostly noises and even see objects move by themselves or disappear from sight. This historic little neighborhood is highly recognized thanks to its brightly colored homes, all in a row. All the homes have a little piece of history attached, and were surprisingly on the brink of decay until being fully restored in 1945. Today, they’re one of the most Instagram-worthy sights in the Holy City, and simply walking through the area is a favorite to-do for many visitors. This majestic southern plantation is America’s most photographed, and it’s easy to see why. Having appeared in many movies, including The Notebook, this working farm has been in continuous operation for over 300 years. You can explore the home and gardens and learn more about the people who once lived here and what life was like way back when. Another piece of Charleston history, the famed Angel Oak is a massive, moss-laden oak tree that is believed to be between 400-500 years-old, though some estimate it closer to 1,500 years-old. Located on Johns Island, the ancient tree is one of the top photography spots in the area. Its gnarled limbs and sheer size are unlike anything you’ve seen in the state. Charleston is known for its eclectic ecosystem of plant and animal life, but you’ll never see it all by car. Take a marsh tour by kayak to get into the little-seen areas, where you’ll find the likes of alligators, wading birds, dolphins, and sea turtles. You’d never know such natural wonders were waiting just beyond the sounds of the city. This fun little beach offers mild temperatures year-round and features tons of things to see, do, and explore. It’s home to the Morris Lighthouse, which is an adventure in itself. This is the top destination in the area for all things watersports, including stand up paddleboards, kayaking, and surf lessons. Plus, you can find some of the best bars and restaurants in the area, including the raved-about Folly Beach Crab Shack. Charleston’s first fort (Fort Moultrie) was built as a protective force in 1776, but was eventually overtaken by the British during the American Revolution. Fort Sumter’s construction began in 1829, but was still unfinished in 1861. Soaked in SC history, the two forts remain strong in local history and are available for tours and exploration. This aquarium features an abundance of local and non-local species alike, including alligators, river otters, a sand tiger shark, and horseshoe crabs. In total, the aquarium is home to more than 5,000 creatures available for you to view. Kids love the touch tank where they can experience some of these animals up close, and there are several additional exhibits inside to create a unique experience every time you visit.